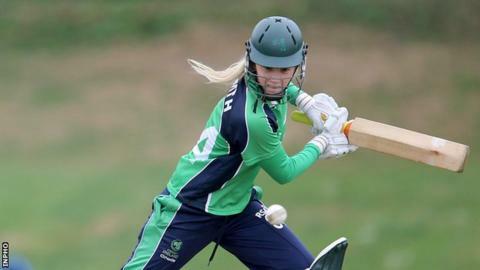 Ireland's women are well placed to progress to the Super Six stage of the World Cup Qualifier after beating Thailand by 46 runs in their final Group A game in Colombo on Saturday. Kim Garth (98) and Laura Delany (50) were Ireland's best performers as they scored 218-7 off their 50 overs. Thailand managed 172-9 in reply, with seamer Lucy O'Reilly taking 3-28. But Ireland must wait for the outcome of Zimbabwe's game against India on Monday to see if they progress. Zimbabwe must beat Group A leaders India, who have already qualified for the Six, and significantly improve their net run rate to overtake Ireland and make the last six. Ireland have won two of their four Group A games, with the top three of the five teams progressing. They also beat Zimbabwe but lost to India and tournament favourites Sri Lanka. Garth hit nine fours and a six in her impressive innings and a partnership of 106 with Delany provided the platform for the victory. Ratanaporn Padunglerd and Suleeporn Laomi took two wickets apiece for Thailand. Nattaya Boochatham made 44 and Sornnarin Tippoch 42 for Thailand, while Amy Kenealy (2-12) and Ciara Metcalfe (2-25) joined teenager O'Reilly in performing well with the ball.